Doesn’t take much to send me down the rabbit hole. I’ve been goofing around with the Starbucks®-style egg bites for a bit now (as you can see here and here), and I’ve had some fun exploring sort of vaguely North American/Mediterranean variations on the theme commercially available at everyone’s favourite coffee charrers. But why not move away from the tried-and-true cheese-and-egg model? How about something vaguely Caribbean? Or Eastern European? Or South Asian? The worst that could happen is the wasteful expenditure of some time, a few eggs, and my interest in “improving” on the already terrific. Soba, awaiting the warm embrace of sauce, eggs, herbs, and fungus. I’m pretty sure you don’t just happen to have 5 ounces (or 150 g) of cooked soba noodles lying about, so allow me to offer you an option for the rest of the soba noodles you’re likely to cook in order to make this recipe. [This No Spoon Necessary blog’s recipe was the inspiration for last night’s dinner, but since the bride and I are ovo-lacto vegetarians until Lent’s end, I had to mess with it a bit. That’s another post for another day.] Also, this version is dairy-free, unlike most other egg bite recipes. Fungus and greens sweating it out. If your leftover soba noodles are in the fridge, put the ones you’re using for the recipe in a bowl with 4 tbsp. / 60 ml of the coconut curry sauce and let them sit overnight, or at least for a couple of hours; they’ll soak up the flavour. If you’re making the noodles expressly for this recipe, take the still-warm drained noodles and pop them in the bowl with the curry sauce and let them sit for as long as you can; overnight is best. In fact, I made both the soba noodles and the mushroom/cilantro/scallion combo the night before, because the timing worked out for me. Oil egg bite tray, distribute soba noodles evenly into each cup and set aside. Chop mushrooms, green onion, and cilantro, place in a small frying pan with 1 tsp. / 5 ml oil (coconut, olive, or neutral), 2 tbsp. / 30 ml of the coconut curry sauce and the first pinch of salt; cook until soft and mushrooms have given up their liquor. Set aside to cool. [You can do this the night before if you want, and allow them to soak up the curry sauce flavour in the fridge.] In a medium size bowl, whisk the eggs, the remaining 4 tbsp. / 60 ml curry sauce, and second pinch of salt together until smooth. Fold in the cilantro, green onions, and mushrooms. Spoon mixture evenly into oiled cups in the egg tray. Add the water to the Instant Pot® container. Cover the egg tray loosely with aluminum foil, place it on the Instant Pot® steaming trivet, and lower it into the Instant Pot®. Set to “Steam” for 8 minutes at high pressure, making sure that the vent is set to “Sealing” rather than “Venting.” When timer goes off, wait four or five minutes (or more, if you desire), and flip vent from “Sealing” to “Venting.” Remove egg bites and allow them to cool for a few minutes before serving, or store in refrigerator up to five days. Reheat one or two at a time in the microwave for 30-40 seconds on “High” and serve. Los cojones del toro. There’s a little something you can’t unsee. We’ve been doing Meatless Mondays around the pad for years now, and that frequently means one of several standbys, often involving potatoes. [What can I say, I’m Irish.] My original intent had been to take a whack at Chef Thomas Keller’s Potato Pavé recipe, but time and energy conspired against me, so I opted for Potatoes au Gratin. As luck would have it, The Bride and I dined a few days ago at Crossroads, an excellent vegan restaurant in Los Angeles, and that inspired me to retool the cheese-oozing, cream-dripping, diet-busting fave of my youth. Generally speaking, I’m not much of a fan of ersatz food products (diet sodas largely excepted). I’d much rather have a beautifully grilled portobello mushroom served like a burger than any sort of the Frankenmeats that often try to pass themselves off as beef patties. As a consequence, my first order of business was to strike off most of the over-the-counter vegan cheese substitutes available, as they more often taste like Firma-Grip paste with a side of FD&C Yellow No. 6 than anything resembling fromage. What I wasn’t willing to sacrifice, though, was the creamy, viscous, umami-laden mouthfeel of the real deal. Fortunately, I didn’t have to. 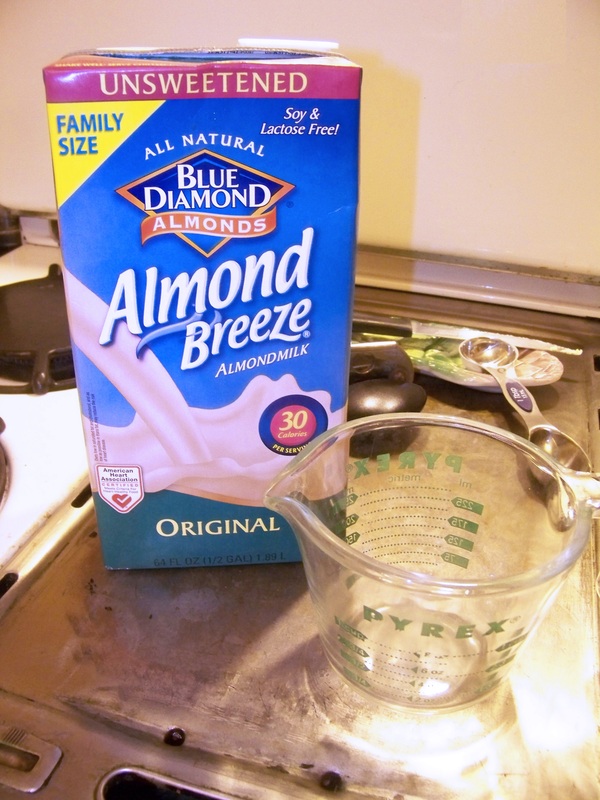 1 can (13.5 or 15 oz) coconut milk* — NOT THE NON-FAT OR LOW-FAT VERSION! 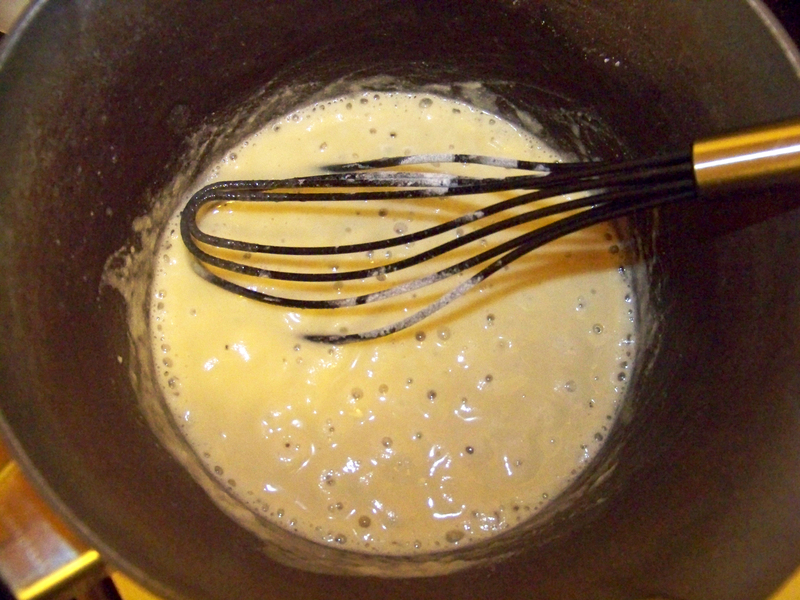 Melt the butter substitute (or margarine, even if it’s not called that) over medium heat in a saucepan or pot, and whisk in the flour a tablespoon at a time, stirring more or less constantly to make a roux. Let it brown a bit, maybe two minutes or so, and then begin adding the coconut milk, about 1/3 of a can at a time. 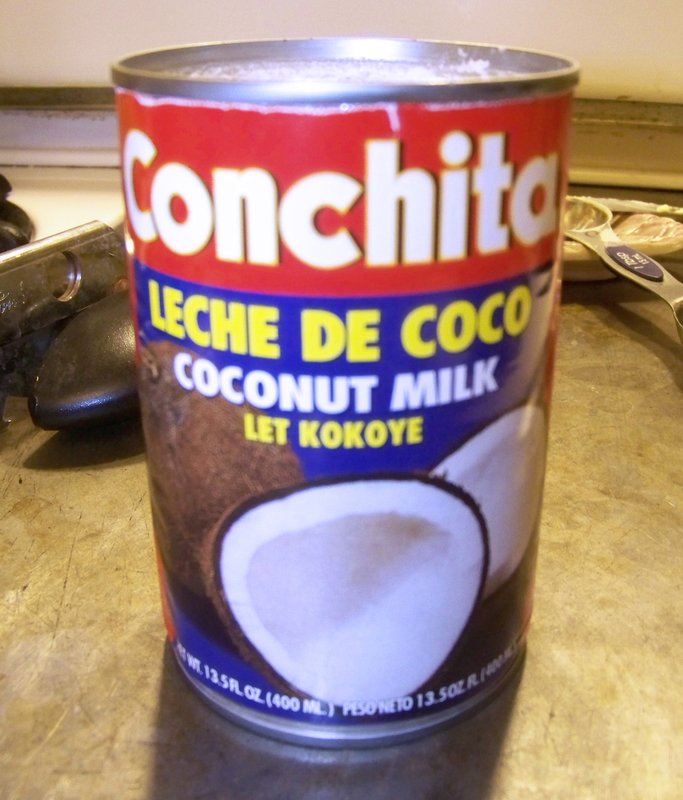 [The full fat variety of coconut milk will probably have a big fatty plug at the top of the can; this is a good thing. Smooth it as you whisk.] 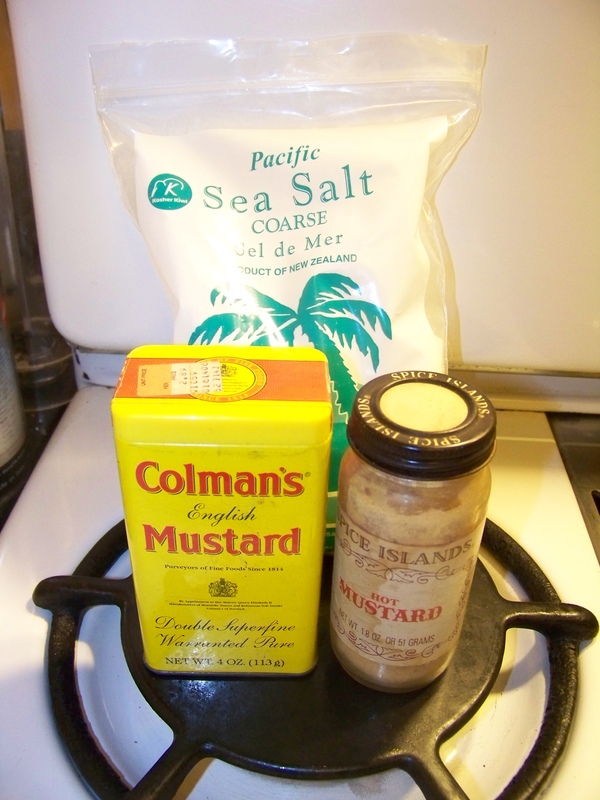 Then add the almond milk and spices, continuing to whisk all the while (nothing says “M-m-m-m, tasty!” quite like a thumbnail-sized lump of mustard powder in your finished dish). 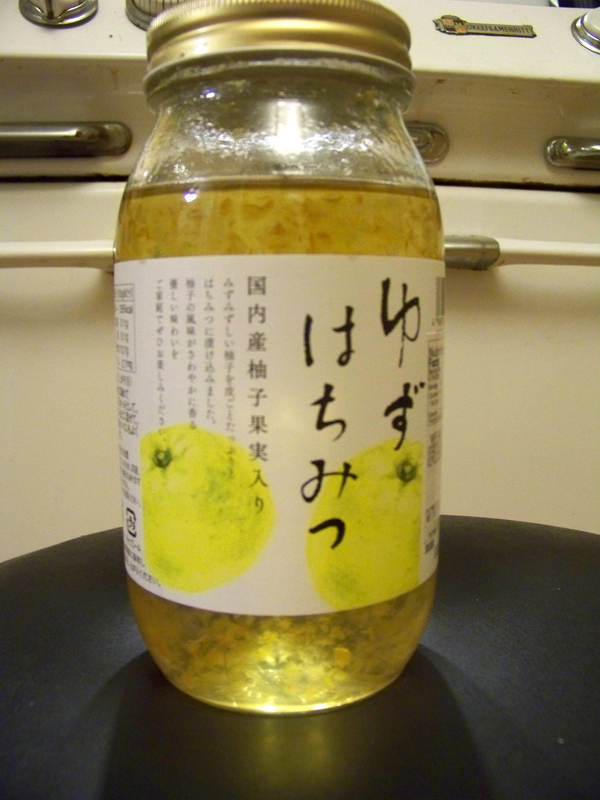 The reason I used tamari rather than regular soy sauce was to keep the recipe gluten-free; if you don’t care about that, your basic Kikkoman will work just fine. All that need be done from here on is to keep it at a simmer; it only has to be warm (and liquid) enough to pour over the potatoes. Cover it (to keep it from reducing) and turn the heat down low while you focus on the next task: preparing the potatoes. 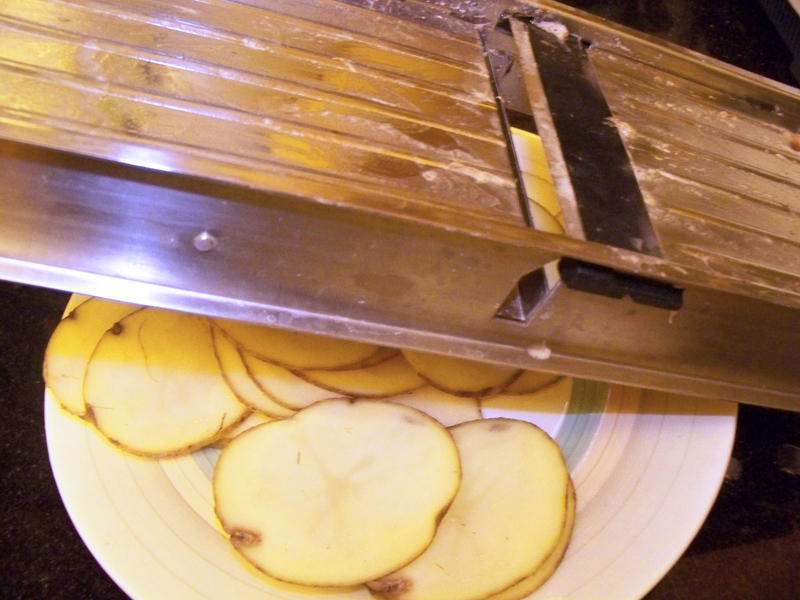 The potatoes (peeled or unpeeled, according to the chef’s whim) should be sliced to a thickness of about 1/8″ or so. More skilled craftsmen than I can perform this task handily with nothing more than a knife, but I use a mandoline (as you can see at the top of the post), and because I am a manly and foolhardy man, I use it without the safety guard. [THIS IS NOT RECOMMENDED!] Should you find the safety guard oppressive, one alternative is to wear a steel mesh or Kevlar glove. But in the true Anthony Bourdain spirit of recklessness, well, I don’t do either of those things. That being said, not only is slicing off your fingertips or shaving your palm — a real possibility! — painful and disfiguring, it also invalidates the recipe’s claim to being vegan. (Blood, even accidentally spilled, is an animal product.) When all the potatoes are sliced (and put in a bowl of water to prevent their discolouring), repeat the process with the onion. Potatoes and onions, ring the bells of St. Bunion’s. 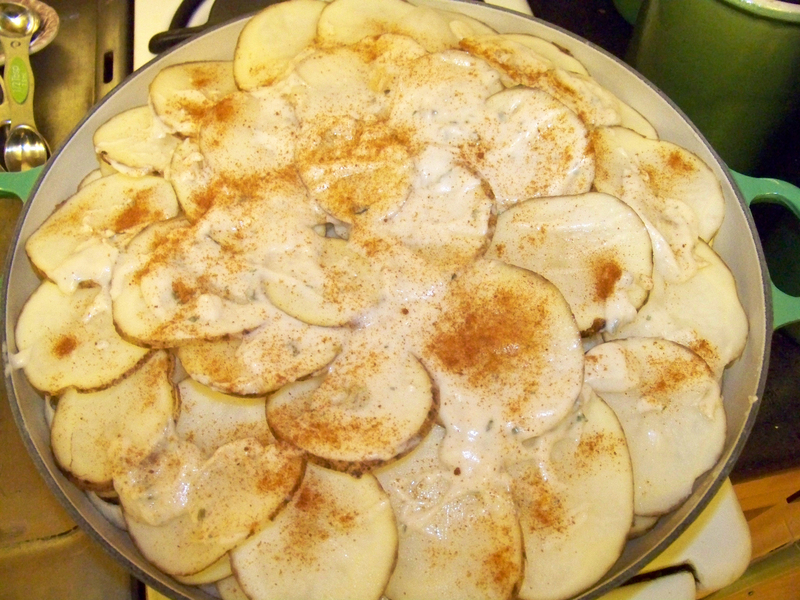 Layer the potatoes and onions into a greased large baking dish or Dutch oven (I used a 5 qt. Le Creuset Braiser, which worked magnificently). 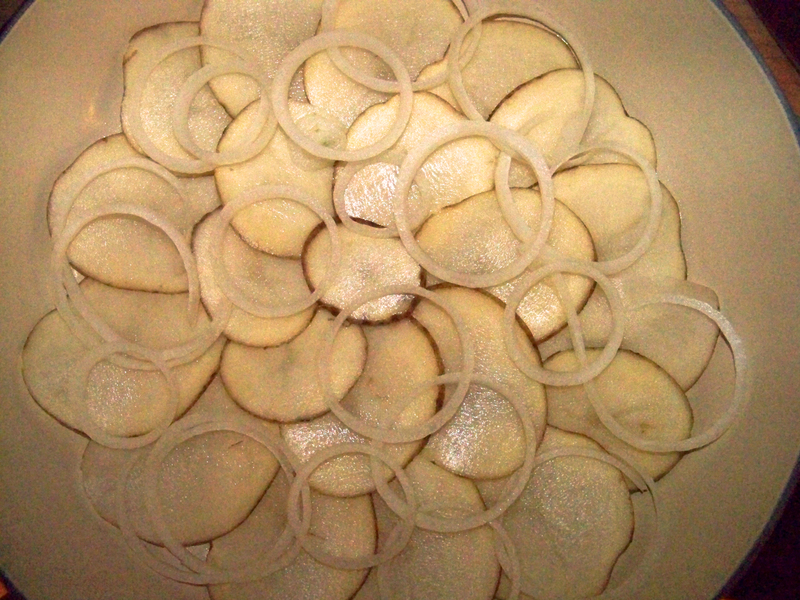 First set down a layer of overlapping potato slices, then scatter some onions on it, then ladle some of the sauce over. Lather, rinse, repeat, until the dish is full (I had about 1/2 lb of sliced potatoes left, which I put in the fridge, and will roast or fry later). Sprinkle some paprika on the top, if you so desire. Cover with foil (or put on the lid), and pop it into the oven for 60 minutes at the aforementioned 350ºF / 175ºC. 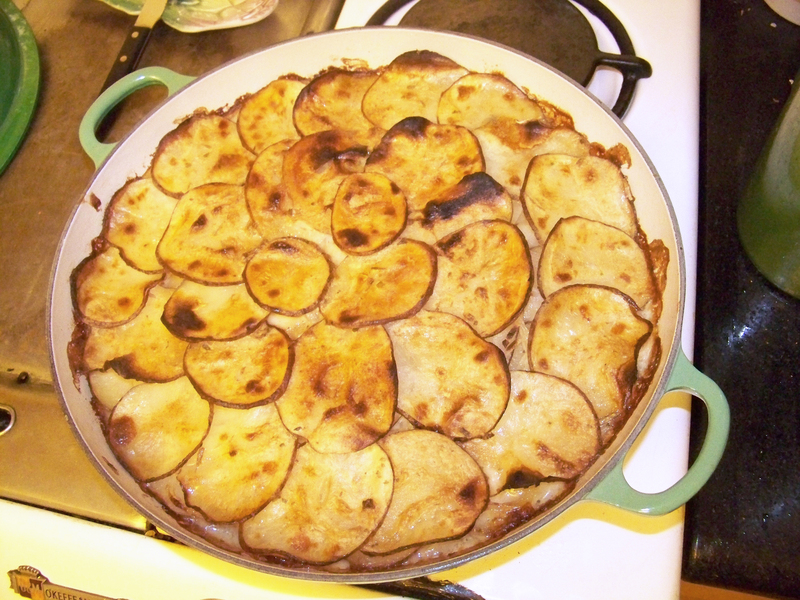 By then, the potatoes should be soft and yield easily to a fork. Give them another 10 minutes in the oven uncovered, and finish them off with about 5 minutes under the broiler to brown the top (be watchful during this process, because it can go pretty fast, depending on the distance between the dish and the flame). Remove from oven, and allow them to cool for about 10 minutes. Coda: I realized (a little too late) that some diced green chiles would be a terrific addition to the sauce; I heated some up and spooned them over top, but it didn’t have quite the same effect. Also, you may want to add some salt (or allow your diners to) at the table, as it was a tiny bit shy on the NaCl for my taste. And a little fresh ground pepper is also nice. 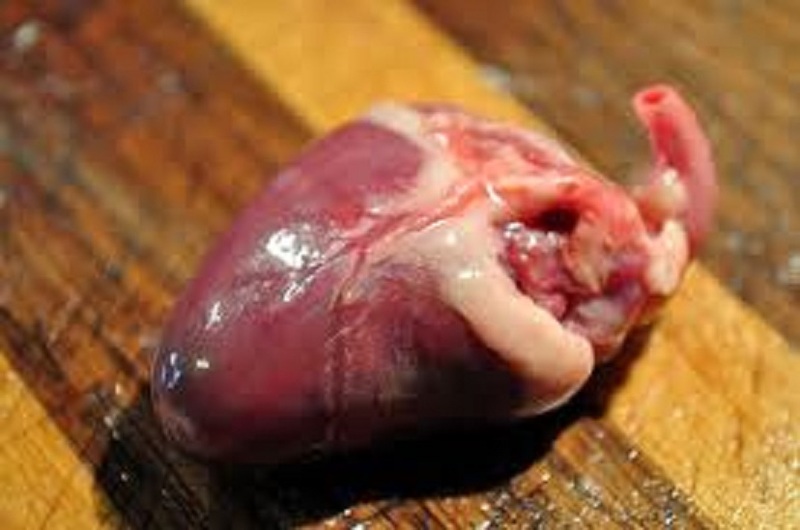 Beware the chicken heart! Not. Seventy-six years ago, the brilliant radio dramatist Arch Oboler wrote a radio play for the NBC series Lights Out called, simply, “Chicken Heart.” The main thrust of the story was that a science experiment had gone terribly, terribly wrong, and what once was a harmless, knuckle-sized, garden variety chicken heart had grown to gargantuan proportions, and was — LUB-DUB, LUB-DUB, LUB-DUB — threatening to take over the world. Good times. As intended, the story terrified a very young and impressionable Bill Cosby, as well as many others, enough so that the story was repeated the following year and again in 1942. It is still regarded as one of the finest examples of radio drama’s darker side. I wasn’t around seventy-six years ago, but I was around in 1966, when Cosby described the depth of his dread on the album Wonderfulness. Like most kids in North America, I wasn’t predisposed to eating organ meats anyway, and the now-disgraced comedian’s riff on Oboler’s play gave me one more reason to avoid the deadly chicken heart. Jump forward forty-seven years or so, to August of 2013. I happened to be shopping in Mitsuwa Marketplace, an Asian grocery store complex that’s one of my favourite local haunts. Other folks, when they go overseas, visit temples or museums or strip clubs. I visit grocery stores. [Yeah, and temples and museums as well. Strip clubs, not so much.] In between travel jaunts, I try to find the most “foreign” grocery stores I can, preferably ones that don’t have English-speaking help. Mitsuwa is as close as I can get to Japan without going into the Little Tokyo section of downtown LA. 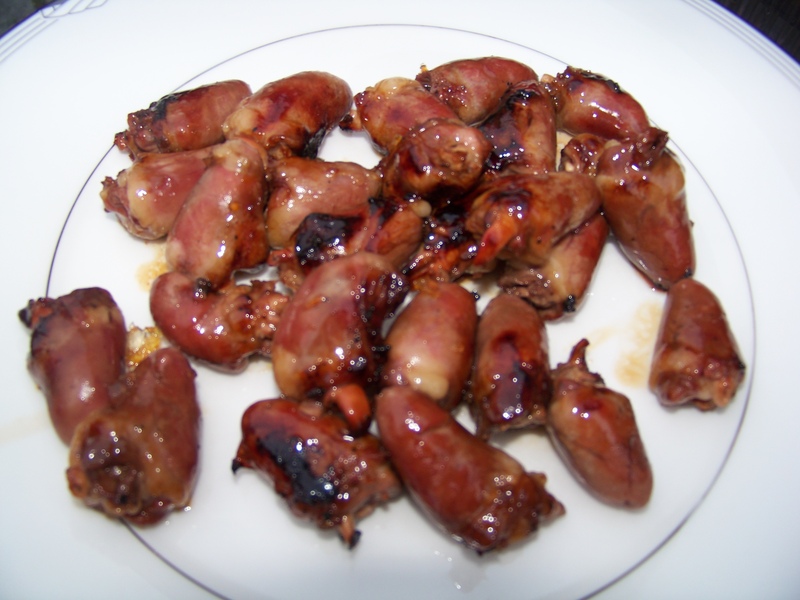 Perhaps because I’d been hankering to visit a (now shuttered) local restaurant called Corazón y Miel (Spanish for “Heart and Honey”), I flashed on the idea of glazing chicken hearts with the yuzu honey. Heck, if the name was good enough to carry a restaurant, it certainly should be able to carry a meal. This may come as a shock to you, but the Interwebs are not exactly chock-full of chicken heart recipes; nor were any of the cookbooks that were immediately at hand. 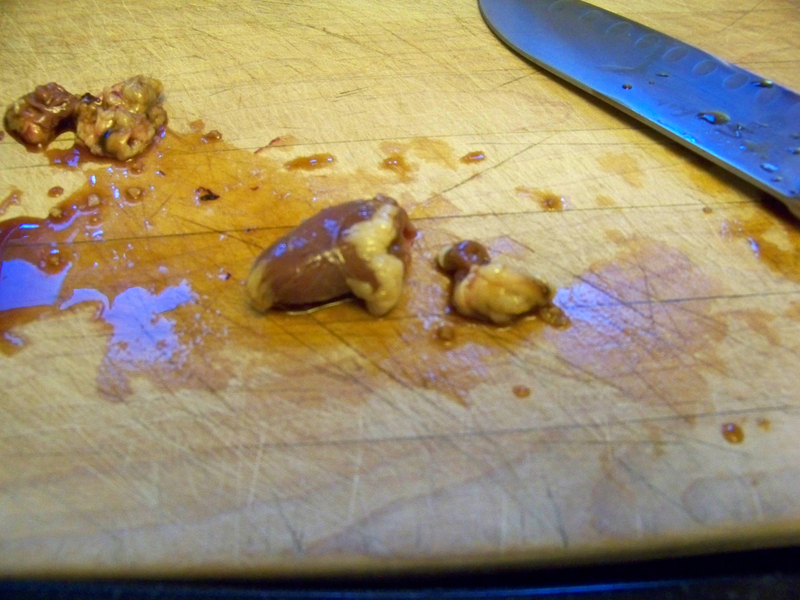 The best piece of advice I got was that chicken hearts should be cooked either very quickly or very slowly; anywhere in between is likely to result in a tough heart, and who wants that? 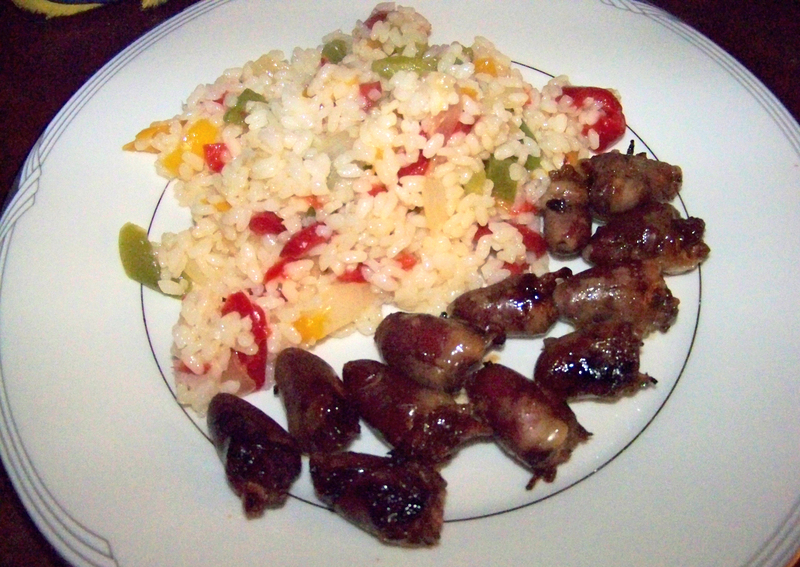 I did stumble across a blog called Cooking in Sens, which had an interesting recipe for a Chicken Heart and Pepper Stir Fry, and I took some inspiration, if not a recipe, from them. Heart with connective tissue separated. More connective tissue from a previous heart at left. 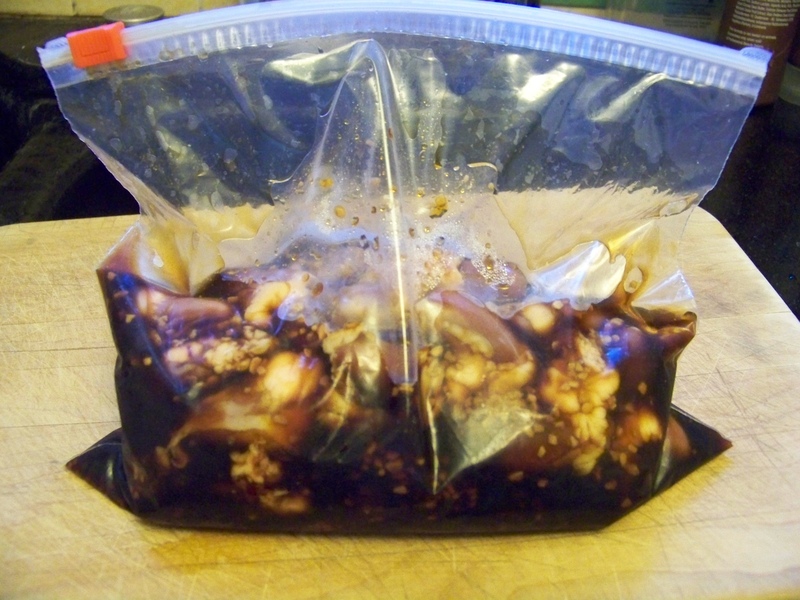 Place cleaned chicken hearts, minced garlic, and soy (or tamari) sauce in plastic bag. Seal, and marinate in refrigerator for 30 minutes to 2 hours, depending on the degree to which time is a factor in getting the meal to table. After marinating the hearts, you have a couple of options; you can either pan fry them, or grill them. I chose the grill because my stove top was taken up with rice and stir-fry veggies, so it was an easy choice. Just season them with a little kosher salt and skewer them on either a metal skewer or a pre-soaked bamboo skewer (don’t want it catching fire or turning to ash on the grill). In either event, you’ll want to pre-heat the grill or the oil in the pan. A quick grill means a tender heart. 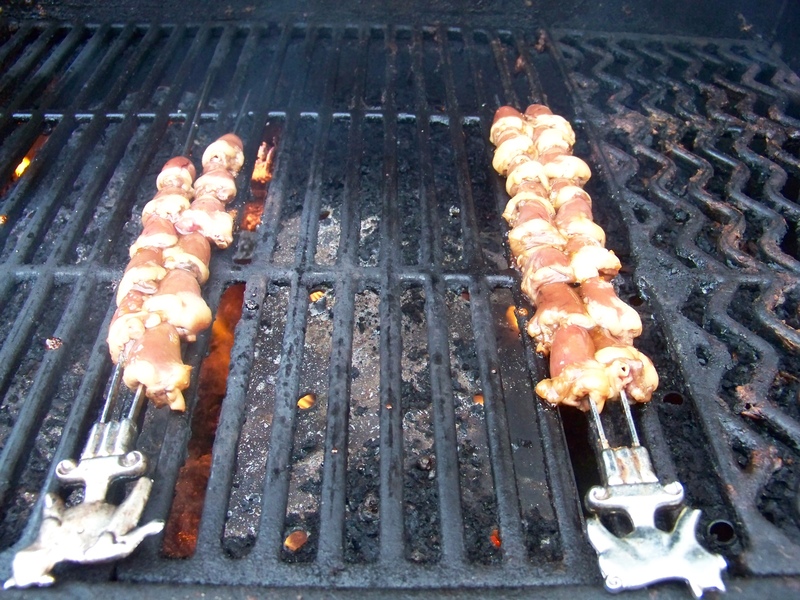 Cook them about two minutes per side, or just as soon as they can be lifted from the grill without sticking. When you first lay them down, brush half the honey on the top side of the hearts; when you turn them over, brush the remaining honey on the now-browned side. After 4-5 minutes (TOTAL! ), you can take them off, and they’ll be perfect. Because my sous chef was me, I placed the hearts into a 200°F/95°C oven just to keep them warm while I finished off the stir-fry veg and rice. They were in the oven for about 15 minutes or so, to no ill effect. When combined with the rice and veg (which themselves had been augmented by a yuzu seasoning base), they made a — ahem — hearty meal. A different way of approaching chicken and rice.